Three years ago, Alan Elliott was at the Telluride Film Festival, prepared to unveil the holy grail of musical works: A documentary on the making of Aretha Franklin's "Amazing Grace," which had been lost to the archives until Elliott spent decades restoring it so it could finally be seen. But then, through lawyers, he got word that the Queen of Soul herself was trying to prevent the film from being shown. Elliott's business partner, Tirrell Whittley, recalls the moment as "deflating." "It was disappointing .... You try to figure out what is it that happened," Whittley said. But as determined as Elliott and Whittley were to get the documentary to the world, they decided not to fight Franklin. "It would just be the wrong and the wrong spirit," Whittley said, adding later: "In talking to Alan, it was really around patience and saying, 'You know what? God may not have meant it right now. And that's OK. Let's just be patient. When God says it's the right time it will be the right time, not just for us but for her, for her family, for her legacy.'" That time has arrived, three months after Franklin's death from pancreatic cancer, with the blessing of her family. And while there are parts of "Amazing Grace" that are rough, from a few off-kilter camera angles to choppy editing, it's a profound, brilliant display of one of the world's greatest singers performing in her element — the church. "It's the most important document of American popular music ever filmed," said Elliott. "It's completely unique to any other experience that I've ever seen, and I've seen a lot of them." The album "Amazing Grace" is one of the seminal albums in not only Franklin's discography, but the canon of American pop music. Franklin, then 29 and at the height of her fame, recorded the album in a Los Angeles church in 1972, with a full choir and an audience that included Mick Jagger, over two nights. Legendary gospel star James Cleveland directed the choir. Franklin's famed father, the Rev. CL Franklin, spoke at the pulpit in praise of his daughter while the revered gospel star Clara Ward sat in the front row. Warner Brothers Films contracted Oscar-winning director Sydney Pollack to helm the movie, with hopes it could be as popular as the concert film of Woodstock. But Pollack made critical errors, including not utilizing a machine to sync the audio to the visuals. With such problems, the film was written off by the movie studio. While the album would go double platinum and become one of best-selling gospel album of all time, the film was forgotten — but not by everyone. Jerry Wexler, the renowned Atlantic Records producer who helmed many of Franklin's greatest hits, told Elliott — his protege, a then-25-year-old music executive — about his hopes to one day get the film to screen, and it would become Elliott's "passion project" for two decades. According to Sabrina Owens, Franklin's niece, the legend spoke about her love for the film. But by the time Elliott and Whittley were ready to release it, Franklin wasn't ready for the world to see it. "I honestly don't know what her concerns were," said Owens. "We never really discussed her business ... . I do know for a fact that she did love the movie." Elliott suspects it may have been frustration at the poor handling of the project. "I'm sure she was upset that Warner Films couldn't finish the movie in the way that she was expecting it to be done and that was probably something that stuck with her," he said. Elliott spoke to Franklin about the project only once — and very briefly. 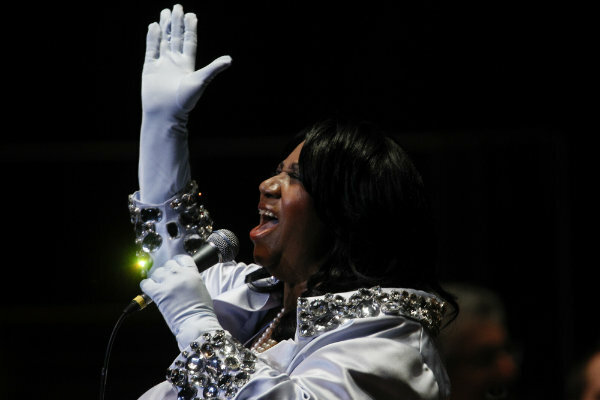 Elliott went to a concert of Franklin's and afterward waited backstage for the Queen of Soul to beckon him, and when she did, he nervously talked about the film project he had embarked on with Wexler. "And she said, 'Yes we'll be talking.' And she walked away." He never spoke to her after that, but kept in touch with her family over the years, particularly Owens, to give her updates on the project. After the Telluride injunction, Elliott reached out again, and Owens explained her aunt was ill. That revelation reinforced Elliott's approach to be patient; he had hoped a recovered Franklin would be involved in the project at some point. "There was no place to have her be a part of the movie while she was not doing well," he said. "We didn't know how sick she was, and we didn't know how long she had been ill."
Owens invited Elliott to Franklin's funeral, and a few weeks later, Elliott screened the film for about 60 members of her family. The reaction was immediate and effusive, and soon afterward, the family agreed to the film's release. "It was just interesting seeing her at that age and her voice was crystal clear, and she just sang her heart and soul out, and almost every song makes you cry or makes you feel some kind of way just like all the rest of her music," Owens said. "So it was it was wonderful. I loved the performance." "Amazing Grace" does not yet have a distributor, but Whittley and Elliott are showing it in New York and Los Angeles to give it a push during Oscar season in hopes it could garner a nomination for best documentary, and it has received resplendent praise since its release. "This film, it's going to take you to church," said Franklin's nephew Vaughn Franklin." You know, I expect to see people up on their feet, tears coming down and holding hands and laughing and joking ... the whole gamut of emotions I think is going to come out there." More than 46 years after it was shot, the Aretha Franklin concert film "Amazing Grace" will finally be released, ending one of the most tortured and long-running sagas in documentary film.